A founding father of modern international law. Extracting what he could from Justinian's Institutes specifically, and Roman law generally, he put together a treatise on the law of nations which was widely read, translated and shaped this then-developing area of the law. Born in Couvert, Switzerland on April 25, 1714, Emerich de Vattel was first a law student but then began and ended his career as a bureaucrat and diplomat. He died in 1767.Known to some as Emer Vattel, he has had his first name spelled with two m's as in Emmerich. Vattel had read and was greatly influenced by a work on early international law written in Latin by Christian Wolff (1679-1754) called Jus Gentium (the law of people). Some cynics say that his great work was mostly just a translation of Wolff's earlier work but it was much more. In any event, Vattel gave extensive credit to Wolff, but also distinguished himself from it where necessary. For example, Wolff had maintained that it would be consistent with natural law for poison to be used in war. Vattel Vehemently disagreed with this. The title is certainly consistent with the verbosity for which international law has become known: Le Droit des Gens ou Principes de la Loi Naturelle, Appliqué à la conduite et aux affaires des Nations et des Souverains. A translation: The Law of Nations or Principles of the Law of Nature Applied to the Conduct and Affairs of Nations and Sovereigns. The formal translated title, for which it became known in the English world (translated in 1760) was simply The Law of Nations. 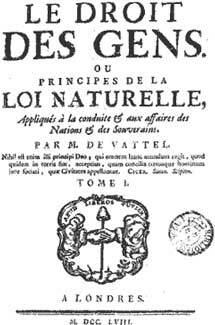 Vattel's work was brilliant and as his title suggested, he did apply a concept of natural law to the law as between states. His premise was that the law as between nations was a derivative of natural law. Of course, the term natural law is controversial. Some hold it to mean laws or rules of conduct which can be substantiated by nature. Others hold it to mean law that is peculiar to man; in the international law cents; law which is common to all mankind. The entire book is a complex but delicious read. It is no wonder that it was so popular. One of the concepts he developed was the authority of a "customary customs" between states. In his Preliminaries to the book, §26, he suggests that such customs are binding on the states, a rule which prevails today, although always hotly debated as to its authority in individual cases. and a sure means of obtaining justice; and finally to defend the whole body against all external violence." "Nature gives men are right to employ force, when it is necessary for the defense, and for the preservation of their rights.... A right of so momentous a nature - the right of judging whether the nation has real grounds of complaint, whether she is authorized to employ force, and justifiable in taking up arms, whether prudence will admit of such a step and whether the welfare of the state requires it - can only belong to the body of the nation or to the sovereign, her representative." Vattel, Emerich de, The Law of Nations (1758), available online as of May 28, 2009 at lonang.com.